It’s 2020 and Mercedes Benz Brampton continues to be consistently rated top 5 or better nationwide in all customer service measurables. The real indication of our success is the constant inquiries from dealerships across the country wanting to know how we do what we do. Many of our customer service innovations – like the personalized Video Multi-Point Inspection – have won awards and been rolled out and implemented by dealerships across North America and Europe. Innovation is only possible with innovative people – and we have the best. There’s no more motivated or passionate leadership team than the management at MBB. They are the most engaged and dialled-in professionals in the industry, living and breathing our corporate vision. They all thrive in our high-pace, high-reward environment and take pride in their ability to mentor and cultivate a young, growing team. It’s no fluke that they have an outstanding team to work with. We hire the best or nothing. We seek out happy, self-motivated and accountable people. People who don’t need to be pushed to succeed but chase success on their own. Over-achievers who are driven to perform, thrive in a fun, high-paced, high-reward atmosphere, and understand that character trumps all. Then we give them the tools they need to go from good to great. We don’t hire employees, we bring on partners who show passion for what they do; who bring a positive and contagious energy that creates the best customer experience in Canada. Our associates are truly mappreciated. We know that their success is our success, so we’ve got their backs – always. No surprise then that we spend $100K/year on personal development and offer some of the best benefits in the country – in any industry. MBB is all about growth, openness, empowerment and inclusion. We are a family that celebrates each other’s successes. Everyone honestly believes they have the best job in the best organization and knows that the entire management team is working for them tirelessly every day. Jonathan has a wide open door policy and everyone is comfortable talking to him honestly and candidly. Associates are empowered and encouraged to take the initiative to get things done, making everyone feel trusted and appreciated, so they come to the dealership each day happy and motivated. It just doesn’t feel like a job. Mercedes Benz Canada has numerous and continuing training programs that we encourage our team members to take advantage of. In addition, and in our quest for constant improvement, the dealership offers several training programs in all areas designed to improve associate performance and help them advance both their personal lives and careers. The management team’s primary focus is to enthusiastically mentor associates on a daily basis. We help our associates connect their job of today with their dreams of tomorrow. This program is designed to enable team members to become the best versions of themselves. Monthly coaching sessions help take people to the next level both personally and professionaly, and chase their dreams in a focused way. A key contributor to our success is effective communication, both internal and external. Daily, weekly, and monthly communications, with stated purposes, and where everyone feels comfortable participating, keeps everyone motivated, inspired, and on the same page. A great example is the daily morning “Jump Start”. A quick 7 minute meeting where teams get together for a brief but meaningful learning experience focussing on a core value element of our service standards, and their main focus for the day. At MBB we like to communicate face-to- face, not screen-to- screen. Internally, email is rarely used. We all work in the same building, so we walk over to colleagues when we have a question. This makes our day more enjoyable and gives us the chance interact with more customers, and see more of our co-workers. Another reason for our success is our continual focus on processes. We are constantly reviewing and improving our processes in all facets of the business in order to enhance the customer experience. We also believe technology can be used to perfect our dayto- day operations, increase sales and create an outstanding customer experience. We never use technology for the sake of it. It is only useful if it enhances an experience or improves a process. We are constantly measuring our advertising effectiveness. We have identified our target and know how to market to them directly at the appropriate time in both their vehicle’s life cycle and their purchase cycle. We continue to benefit from Mercedes Benz corporate advertising and have stepped up our own marketing efforts. Our customers expect a level of service beyond the norm and our team members are trained to take care of them better than anyone anywhere; better than the finest maître d’, the most upscale store clerk, the most seasoned concierge. That is what keeps them coming back, and that is what makes them tell all of their friends and family that Mercedes Benz Brampton is the only place to buy or service your car. Money can’t buy advertising like that. 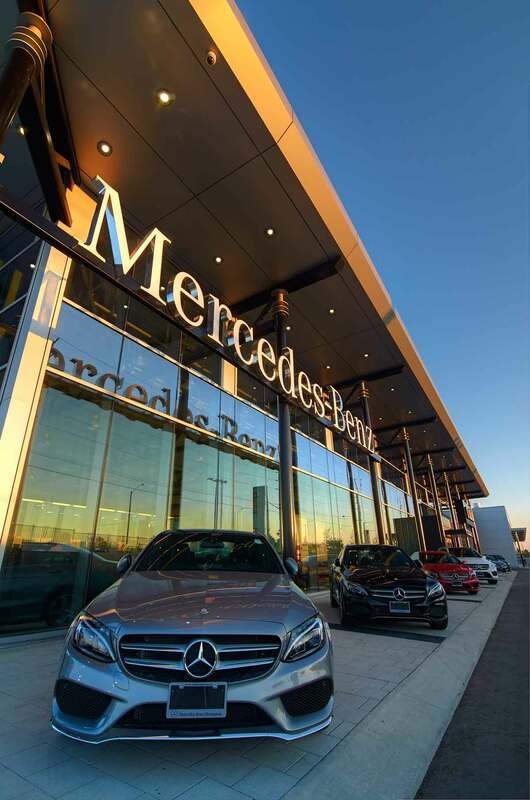 With a state-of-the-art 50 car showroom and all of the support staff that goes with it, we are now the biggest Mercedes Benz dealership in the GTA with the highest sales in Canada! Our shop boasts 35 lifts and 35 highly-skilled technicians. 25 sales people deliver 2000 new and 1000 used cars per year, and 3 Sprinter salespeople deliver 300+ Sprinters annually. More than 70 loaner cars ensure our customers are never without wheels. On the strength of our biggest asset, our people, our company is constantly hitting all of the manufacturer targets in sales and customer experience. Giving back is something that comes naturally to all of us – on both a corporate and personal level. Whether it be through our various community sponsorship events, golf tournaments or giving to local charities, we continue to be supportive of the communities that we do business in. Associates always chip and are given 2 paid community days per year, making giving more than just time, it’s a part of their lives.